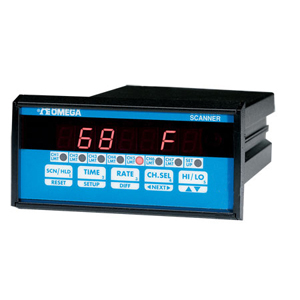 The DPS3000 Series Scanners monitor up to seven individual inputs. Each channel on the DPS3200 and DPS3204 can be programmed to accept different types of inputs, while the DPS3100 and DPS3104 are limited to one input type on all channels. Temperature is displayed in °C or °F, while voltage and current signals can be scaled. All models can be set up to display in any one of six operating modes: automatically scan and display each channel; show elapsed time; display the channel with highest or lowest reading; scan each channel’s deviation from a preset setpoint; show differential between a ‘master’ channel and other inputs.